Highly recruited after gaining 7738 rushing yards in high school, Sims was initially hampered by injuries at Oklahoma but broke out as a junior to rush for 1762 yards and 20 touchdowns to win the 1978 Heisman Trophy, While he followed up with 1509 yards and 22 TDs in ’79, he finished second in the Heisman voting but was taken by the Lions as the first overall pick of the 1980 NFL draft and moved directly into the starting lineup. Lions went 9-7 to finish second in the NFC Central while finishing third in the NFL in rushing (2599 yards). Sims went to the Pro Bowl the next two seasons, following up his outstanding rookie year with 1437 rushing yards, 451 pass receiving yards, and 15 TDs in 1981 and 981 total yards during the strike-shortened ’82 season. 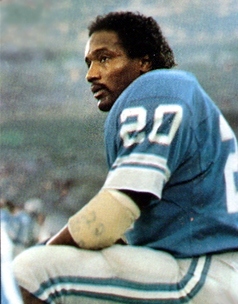 He was back over a thousand yards in 1983 (1040) and caught 42 passes, but after getting out of a contract that would have had him jumping to the USFL’s Houston Gamblers and instead re-signing with the Lions, he suffered a major knee injury during the ’84 season that finished his career. Over the course of five years and 60 games, he rushed for 5106 yards while averaging 4.5 yards per carry, caught 186 passes for another 2072 yards, and scored a total of 47 touchdowns.